Dr. Dimitrios Karussis at the San Francisco conference. Photo by Josh Edelson. A new treatment for the devastating and fatal disease known as ALS has completed its first clinical trials at the Hadassah–Hebrew University Medical Center in Jerusalem with very promising results. A first-of-its-kind approach to treating ALS (amyotrophic lateral sclerosis, also known as Lou Gehrig’s disease, Charcot’s disease and motor neurone disease), the therapy uses the patient’s own stem cells to regenerate diseased brain tissue. Researchers are hopeful that it will also be applicable to other neurodegenerative diseases—multiple sclerosis, Parkinson’s and Alzheimer’s among them. The treatment protocol was designed and performed at Hadassah Hospital with BrainStorm, which owns the intellectual property for the cell preparation called NurOwn. Results of these early clinical trials (Phase 1/2 and Phase 2a) were reported as a landmark finding in JAMA Neurology, Journal of the American Medical Association, in its online edition in January. It will be in print in March. ALS affects some 450,000 people worldwide, with someone, somewhere, newly diagnosed every 90 minutes. It attacks motor neurons in the brain and spinal cord—the cells that are vital for muscle function. Muscle weakness progresses to paralysis and, ultimately, to respiratory failure. Nine in ten ALS victims die within two to five years of their early symptoms. “While our treatment doesn’t cure ALS, the data strongly indicate it has clinically meaningful beneficial effects,” reports Dr. Karussis, who announced his team’s findings at a news conference in San Francisco on January 11, the day that the JAMA article appeared online. 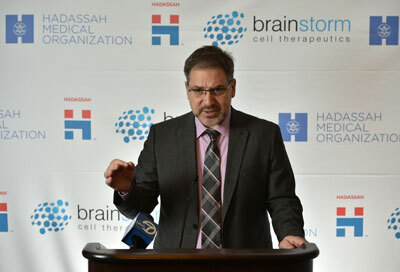 Jointly sponsored by BrainStorm, Hadassah Medical Organization and Hadassah, the Women’s Zionist Organization of America, the news conference took place on the periphery of the J.P. Morgan Healthcare Conference, which brings together health care companies and investors. “In close to 90 percent of patients who have received our therapy, progression of their disease and its impact on their neurological function is down by 25 to 75 percent,” says Dr. Karussis. “Several participants in our trial experienced significant improvement in their motor ability and breathing. Dr. Karussis and his team have spent the past 15 years researching and developing adult stem-cell therapies. In 2010, they successfully completed the world’s first clinical trial of stem-cell therapy for multiple sclerosis and ALS. Hadassah neurologists were the first to discover that the brain’s stem cells have healing qualities. Unfortunately, “these intrinsic neuronal stem cells are very scarce, and their ability to regenerate damaged brain and spinal cord is thus limited,” Dr. Karussis says. Convinced that using the body’s natural healing mechanism was the way to go in treating ruinous nervous-system diseases, the Hadassah team began looking for other sources of suitable stem cells. They found them in the body’s largest stem-cell reservoir, the bone marrow. Known as mesenchymal cells, they comprise a scant 0.1 percent of all bone marrow cells. This was when Hadassah teamed up with cell-therapy developer BrainStorm. With its proprietary NurOwn technology, BrainStorm cultures, enhances and enriches the mesenchymal cells and nudges them into becoming powerful neuron-supporting cells. Because patients serve as their own donors, these cells have a high safety profile: There’s no rejection, no need for immunosuppression and a minimal risk of malignant transformation. ALS clinical trials with U.S. Food and Drug Administration-approved NurOwn-prepared cells began at Hadassah Hospital in 2011. Patients with early-stage ALS were recruited, their bone marrow was harvested and prepared, and the modified cells, now producing large amounts of nerve-growth factors, were injected back into the patients’ cerebrospinal fluid using a technique developed by Hadassah investigators. In 23 of the 26 people who took part, differing levels of improvement in the course of their ALS were seen. Among them is a young man who was diagnosed with ALS at age 21, while serving in the Israel Defense Forces. The treatment not only halted the progressive weakness in his legs, the paralysis in his arms and his inability to speak, it even partially reversed them, according to Dr. Karussis. When some symptoms reappeared, the young man was given a second treatment and has been stable for the year since then. The clinical trial protocol currently allows only one treatment per patient, and Dr. Karussis is seeking special permission for future treatments, as necessary. Phase 2 clinical trials—double-blind and placebo-controlled—are currently under way in the United States using a protocol identical to the one at Hadassah Hospital. Approved by the FDA, the two-year, second-phase trials are being conducted at the Mayo Clinic in Rochester, Minn.; Massachusetts General Hospital (a Harvard affiliate) in Boston; and the University of Massachusetts Memorial Medical Center in Worcester, Mass. They are scheduled to end this summer.